Filing for bankruptcy without a bankruptcy lawyer may cost hundreds if not thousands of dollars less, but carries several risks. The primary disadvantage of filing for bankruptcy without a bankruptcy lawyer is the risk of filing a defective bankruptcy petition, schedules, and statements. This page will discuss the disadvantages of filing for chapter 7 bankruptcy without a lawyer. Due to the complexity of creating a confirmable chapter 13 plan, it is assumed that most chapter 13 petitioners will hire a chapter 13 bankruptcy attorney. It should go without saying that bankruptcy documents drafted by non-attorneys have a higher probability of being flawed than documents drafted by attorneys. However, many pro se filers optimistically acknowledge this fact but nevertheless file on their own (to the chagrin of many bankruptcy court personnel). To be fair, these pro se filers may have been shocked by the quotes of some unnecessarily expensive bankruptcy attorneys and felt that pro se was their only choice. Hindsight being 20/20, these pro se filers should have called a cost-effective bankruptcy lawyer, and hired a bankruptcy lawyer whose fees were less than the expected value of the bankruptcy. The consequences of flawed bankruptcy documents can be severe. For instance, incorrectly applying exemptions on the bankruptcy schedules can lead to misapplied exemptions that leave otherwise exempt property vulnerable to liquidation; omitting creditors or incorrectly listing their addresses can lead to their claims not being discharged; and errors in the means test calculation can lead to failure of the means test and disqualification from chapter 7 bankruptcy. To avoid these consequences, maximize your discharge, and keep as much of your property in chapter 7 bankruptcy as possible, you should hire a bankruptcy lawyer. 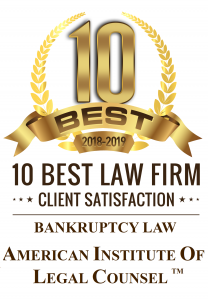 Before making the decision to file for bankruptcy without a bankruptcy lawyer read the page on the United States Courts’ website titled filing for bankruptcy without an attorney. While they do advise you to hire a competent bankruptcy lawyer, they include links to free legal services that may help you file for bankruptcy on your own. Our bankruptcy lawyer is available for free consultations. Get advice before filing for bankruptcy on your own. Call our bankruptcy lawyer at (916) 596-1018.